On Sale Now! Free Shipping Included! 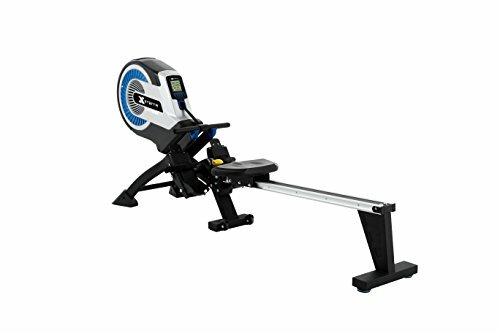 Save 2% on the XTERRA ERG500 Air Turbine Rower, Silver/Black by XTERRA at M's Dance Center. MPN: ERG500. Hurry! Limited time offer. Offer valid only while supplies last. XTERRA ERG500 Air Turbine Rower There are few exercises available that work as many muscle groups through as wide a range of motion as rowing. The advanced design of the XTERRA ERG500 air turbine converts wind power into resistance to closely simulate the action of rowing. The conveniently located lever adjustment features 8 resistance levels, which regulate the airflow out of the air turbine. This allows you to quickly and easily control your resistance during your workout. • Weight limit: 300 lbs. • Assembled dimensions (L x W x H): 72” x 19" x 33"
• Assembled weight: 79.4 lbs.